One segment of the historic Bridger Trail was recorded in Fremont County. 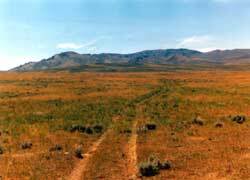 It is along the gentle slope of a ridge between upper Bridger Creek and South Bridger Creek. This is near the top of the Bridger Mountain Range north of the town of Lysite. The trail segment was evaluated for its eligibility to the National Register of Historic Places. This is a measure of how important and unique the site is. 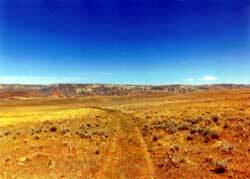 The Bridger Trail as a whole is eligible for listing on the National Register because of its significance as an interregional transportation route through Wyoming's Big Horn Basin to the Montana gold fields and because of its association with mountain man and guide, Jim Bridger. This segment in particular was recommended as contributing to the site's overall National Register eligibility. The trail in this area retains good overall physical integrity characterized by a gentle swale, and the surrounding viewshed possesses excellent integrity of location, setting, feeling, and association due to the lack of man-made intrusions on the landscape. The recording and evaluation was done to mitigate effects to the trail that resulted from the construction of the Express Pipeline in Wyoming. The cultural resource mitigation for the site also included large-scale photographic documentation of the segment, a published monograph on the Bridger Trail, and placement of an interpretive sign along the east side of Wyoming State Highway 16/20 north of Lucerne, Wyoming.